Cook bacon in dutch oven until crisp. When crisp, remove bacon to a paper towel. Drain any excess grease from dutch oven and allow dutch oven to cool for safety. Unroll bread dough onto a floured board and stretch it in one direction as much as possible without tearing. Spread ham over dough, leaving at least 1/2 inch on one long edge uncovered. Spread bacon, onions, and cheese over ham. Starting with the edge opposite the uncovered long edge, roll the dough back into a loaf shape. Press the outside seam edge closed. When the dutch oven is cool enough to not get burned, place the loaf into the dutch oven, seam down, making a circle with the ends meeting. Press the ends together to make a complete circle. Cover with the dutch oven lid and Bake at about 350 degrees for about 30 minutes, until the dough is golden. 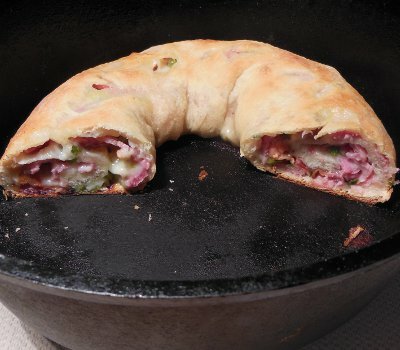 Remove the lid and let the Stromboli cool for a few minutes before slicing. Let me know how you enjoyed your Stromboli!